For what it’s worth, we agree 100% with The Bajan Reporter. Oprah was once a serious journalist who broke important stories. She was once a skilled interviewer who was unafraid to ask ‘difficult’ questions. “Where did Oprah fall down? Many areas, where to start? Since Oprah herself pointed how TIME listed “RiRi” as one of the 100 most Influential People of the Year, then knowing the Westbury girl is considered a role model whether she likes it or not, then why did Oprah not ask her about how Nivea cancelled her huge contract? What was Rihanna’s big idea of sporting C**T on a pendant into a Catholic Church – how could Oprah miss such a thing if she is truly concerned about women’s rights? Even “RiRi” using the same jewellery when taking photos with young fans at their parents’ ire? Rihanna back with her abuser Chris Brown – Will Oprah tell it like it is? Rihanna and Oprah are in Barbados today, touring about and filming for an upcoming Oprah television spot. 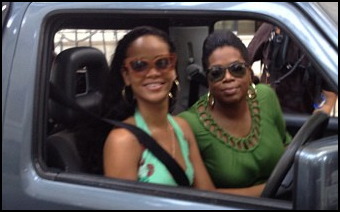 Oprah sent out a photo to her fans of the big O being driven around the island by RiRi. And by a strange coincidence (ha ha) the Barbados Tourism Authority announced another media campaign with Rihanna in the spotlight telling about how wonderful it is in Bim. And so it is. Then in the middle of all that positive vibe we have the news that Rihanna and Chris Brown are back together as a couple. … and that JAY-Z has given Rihanna and Chris Brown’s relationship the seal of approval. The court also heard that, as is often the case in these couples battles, there had been previous incidents of violence by both Brown and Rihanna. The sentencing report also confirmed the rumours about Chris Brown smashing the windows and mirrors of Rihanna’s Land Rover when they were in Barbados as a couple. Hopefully both of them will have learned something from their mutually-destructive attraction for each other. The big life lesson is this: at the first sign of abuse – whether physical or verbal – terminate the relationship immediately. … Anne Caroline Drake speaks of what she knows personally in her article Rihanna: Should You Stay? Should You Leave? Anne Caroline Drake visited our blog and left words on the Rihanna/Chris Brown saga a few times. I guess you would call Anne an activist against domestic violence and child abuse. She met President Clinton three times and that is three times more than me. I don’t know if she ever read our articles titled Beat Your Wife In Barbados? You Are Protected From The Police If You Live In A Gated Community! and Do We Need Signs Like This In Barbados? but I think she would appreciate them. If you care about domestic violence or if you want insight into why women and Rihanna have difficulty leaving abusers, you should read her article on Rihanna and some of the other things she writes. Anne thinks Oprah and Dr. Phil are wrong about domestic violence and she has convinced me.